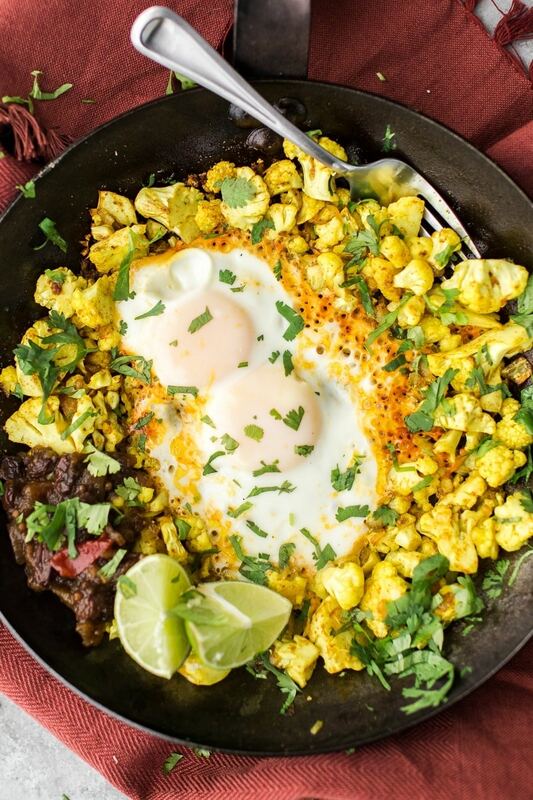 Turmeric Cauliflower Egg Skillet | Naturally. I love whipping up lunches that have no recipe and sharing them on Instagram. Sometimes, I use it as a metric for what I should post on this site. If I post a meal to Instagram and it’s not popular, it most likely won’t ever see the blog. (Unless I love it, of course. Then I still might share it.) However, if I get a bunch of “Where’s the recipe?! ?” in the comments, I know it’s time to remake the recipe and nail down the ingredients. 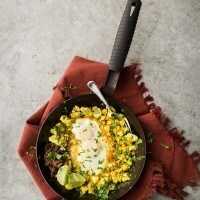 This cauliflower egg skillet is the first to make the transition from Instagram to the blog. I made this recipe to play with turmeric. I thought it was good but honestly didn’t think anyone else would agree. Turns out I was wrong. Over medium low heat, melt 2 teaspoon coconut oil in an 8 to 10 inch skillet. Add in the onions, followed by the cauliflower. Cook, stirring occasionally, until the onions and cauliflower are slightly brown and tender, about 5 to 7 minutes. Squeeze in the lime juice and scrape up any stuck pieces. Add in the turmeric, ginger, and cayenne (if desired). Cook for 1 minute more, just to warm the ginger. Melt in the final 2 teaspoons of coconut oil in the skillet then create a well in the center. Crack the eggs in the center, reduce the heat to low and cover the skillet with a lid. Cook until the egg whites are set and the egg yolks are at your desired firmness, 8 or so minutes for over-easy eggs, longer for more firm yolks. Serve with extra lime juice, minced cilantro, and apple chutney (if desired). 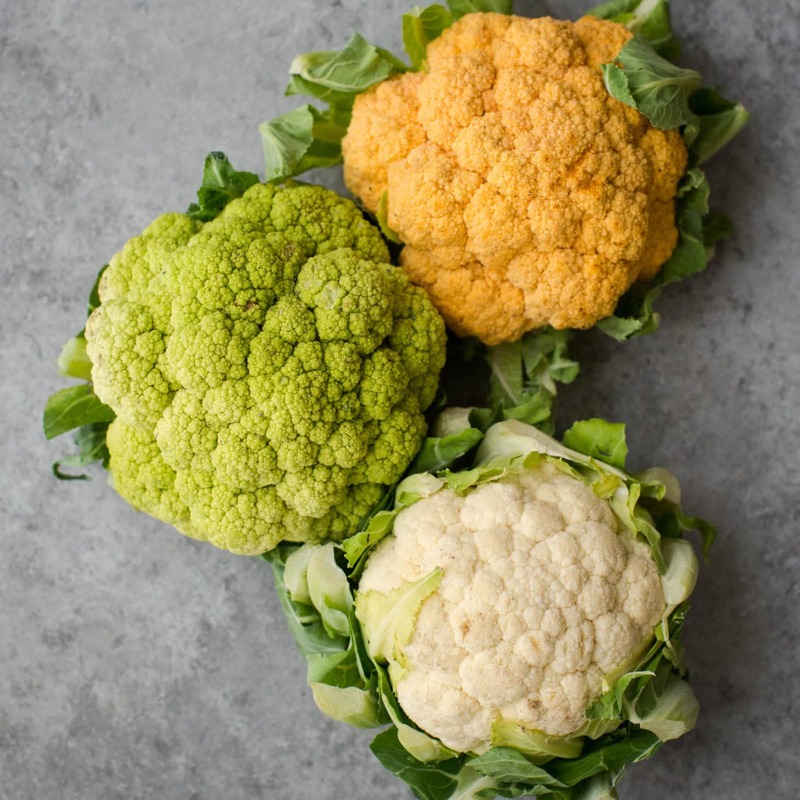 Tips & Tricks: The cauliflower stays fairly crisp (which is what I prefer). If you want your cauliflower more tender, you can parboil or steam it first. I’m a little heavy handed with the coconut oil in this recipe, you can reduce it but know the eggs and cauliflower may stick. As such, I recommend using a well seasoned steel pan. Plan ahead: find this recipe in the Naturally Ella Real Plans upgrade. The flavors in this skillet are fairly straightforward. I rely heavily on ginger as the turmeric doesn’t have a strong presence. As for the apple chutney, feel free to use a homemade or store bought version. 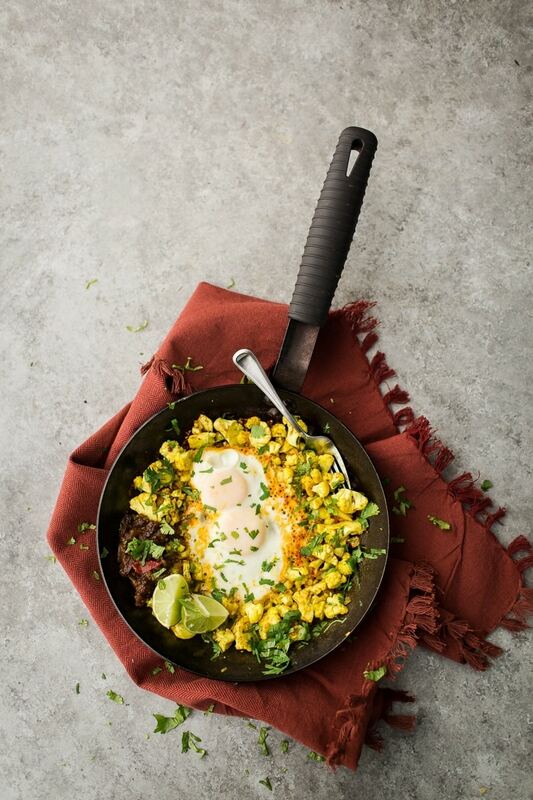 The end result is slightly spicy, slightly sweet skillet (thanks to the chutney) and one hearty meal. Great for breakfast or lunch. Add vegetables: Add in other vegetables that would cook well in a short amount of time such as parsnips, carrots, or even small cubes of sweet potato (I personally think sweet potato would be amazing in this dish). Vegan: Instead of doing the skillet all the way out, make the cauliflower and then mix it with your favorite grain. This cauliflower would be excellent mixed in with quinoa for a grain salad (but I’d still recommend the chutney)! Chile Paste: I used cayenne but the third time around, I mixed in some chile paste for an even spicier kick. It’s good, but I prefer the ginger/turmeric to be the stars and not be overpowered by heat. Looks great, will definitely be trying it! I’ll add some cooked quinoa to it too. I love this, It looks delicious and tumeric is such a health bomb, I’ll definitey try this. I’m always trying to find new ways with cauliflower. This looks like a delicious combination and I’m obsessed with turmeric these days. It makes such a beautiful hue. YUM! Love any turmeric + egg + veggie combo. Such a lovely spice made up of feel-good/wellness properties. Will definitely be trying this with the chutney addition, so fun. WOW that looks amazing! I’ ll try it soon. I love cauliflower! I love combining turmeric with eggs! Adding cauliflower is a game changer. Glad it made the recipe book! There’s a print button right next to the title!